In music, a scale is a series of notes played one at a time in ascending and descending fashion. Scale notes make patterns on the fretboard, which guitarists finger and pick position to position. Guitar players use scales to play melodies, riffs, solos, and bass lines. There are countless types of scales that can be played on guitar, but did you know that popular music is mostly based on just two types of patterns? That’s right. Familiar genres of music like pop, rock, blues, and country use scale patterns based on the pentatonic scale and major scale. Another type of scale, the harmonic minor, is worked into these patterns on occasion. If you want to be successful playing popular styles of music, then you need to focus your attention on these scales. Don’t believe me that these scales are used the majority of the time? Let me prove it to you! Below is a list of famous guitar solos, ones that frequently make “Top Guitar Solos of All Time” lists, and the scales they use. I hope you get my point. Since some of these solos are performed by highly skilled players, you might expect the scales used to be something out of the ordinary, perhaps exotic scales out of an advanced level scale book, but they are not. I would point out that the way in which scale patterns are mixed can get a little tricky, major scale patterns can produce different modal sounds, and players often work in chromatic half-step movement in between scale tones (called passing tones), but the base patterns still remain those of the pentatonic and major scale. In fact, the harmonic minor scale is really just a slightly modified minor scale, one in which a note is temporarily raised to follow a certain type of chord change. In other words, even when players use the harmonic minor scale, they’re still working within the same pentatonic and major scale base patterns. This is why you need to practice pentatonic and major scale patterns and master all the ways in which they are applied. One thing distinctive to guitar is the availability of unison pitches on the fretboard. In other words, the very same pitch can often be played in more than one location. Typically, a scale has a fixed number of notes, like five or seven, and these notes can be played in more than one position on the neck. Additionally, when scales ascend and descend, their notes can be repeated in higher and lower registers until no further pitches are available. All this to say that the notes of a five or seven tone scale are actually scattered all over the fretboard with multiple occurrences of each note and higher and lower versions of each pitch found everywhere. In order for guitarists to learn the notes of a scale across the neck, they break up the fretboard into sections called positions. The scale notes in each position form a pattern. You rehearse and memorize these scale patterns until all areas of the fretboard have been covered and you can freely use the scale anywhere. Perhaps the most widely known and used scale pattern on guitar, this pentatonic scale pattern functions as either E minor or G major in this open position, but is moved around the neck to play in other keys too. Try playing through these notes one at a time from lowest pitched note to highest pitched note, then reverse your direction. The major scale features seven notes, which is two more than the pentatonic scale. Like any scale, its notes are scattered all over the fretboard and you need to learn them one position and one pattern at a time. Because of the additional notes, major scale patterns are more complex than pentatonic scale patterns, and they necessitate the use of more fingers. As a result, making your way around the neck with the major scale requires more work. There are also more possibilities when it comes to forming patterns. You usually see the major scale taught as either five or seven patterns. Either way, the patterns are still the major scale. I teach patterns as both a set of five and seven in the Fretboard Theory video instruction featured in the GMT member area. Any one of the major scale’s seven degrees can be used as the primary pitch in a piece of music. The structure and sound of the scale changes depending on which note is used. This means that major scale patterns are used to play any one of seven types of scales called modes. The two most common modes are named Ionian and Aeolian, which stem from the 1st and 6th degrees, and are better known as the relative major and the relative minor scale. Major scale patterns are used to play many familiar guitar songs. Listen to the audio track below to hear some examples. In this fretboard diagram you see where all the notes related to the G major scale are located in one position. The numbers here represent scale degrees, not fingerings. To play G to G, start and end on 1. Another type of scale that occasionally occurs in popular styles of music the is harmonic minor scale. Typically, a piece of music is not solely based in the harmonic minor scale, but rather the music uses the scale temporarily to produce a certain type of harmony. And the harmonic minor is really just a slightly modified minor scale, with one pitch raised to fit with a specific kind of chord change. When it comes to learning this scale and its patterns, I believe you’re better off making easy adjustments to the minor scale rather than working at covering the whole neck with new harmonic minor scale patterns, although, the latter is an option and can serve a good purpose at some levels of playing. One variation on the harmonic minor scale that comes up every so often is the melodic minor scale. As for all other types of scales (which I won’t bother mentioning here because I don’t want to confuse you), you rarely, if ever, hear them used in popular styles of music. You start to come across other types of scales as you venture into less familiar and often more complicated genres of music like bebop jazz and neoclassical. That said, guitarists in these genres still rely on the fundamental scales that I have outlined here (namely the pentatonic and major scale patterns), so be sure to have the same groundwork in place before you attempt to play like them. So even if you’re strictly a rhythm guitarist or songwriter, you can still benefit from learning scales. Other instruments, such as keys, horns, and strings, use pentatonic and major scales too, which is of interest to composers who prefer to arrange on guitar. Would you like to learn more about music theory for guitar so that you can have a better understanding of how to play and compose songs? Studying theory will uncover the mysteries of music and help you more quickly develop your skills as a guitarist, songwriter, improviser, and composer. 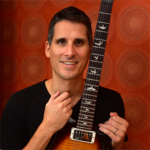 Sign up to receive my FREE 6-step email course, “Bedrock Guitar Theory of the Pros“, and discover the 6 simple concepts that will have you rockin’ guitar music like a pro in half the time of ordinary lessons.